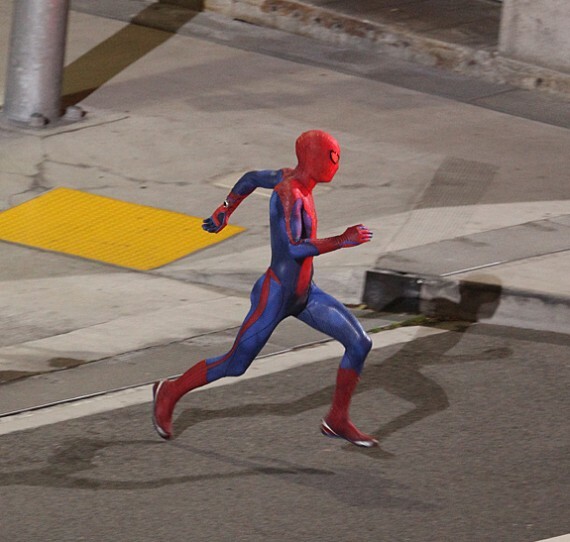 Sony recently unveiled a first look at Andrew Garfield in Spider-Man garb for the forthcoming reboot of the popular superhero franchise, but the unmasked photo that circulated online earlier this month raised more questions than answers. What will Spidey’s mask look like? Are those things on his wrists mechanical web-shooters? Now, keep in mind this is likely a version of the costume used for stunts and wide shots, so the redness of the eye lenses and the bizarre metallic sneakers he seems to be wearing aren’t necessarily representative of what we’ll be seeing in Marc Webb’s 2012 film. That said, check out Spidey’s wrist. It looks like Sam Raimi’s controversial organic web-shooters are a thing of the past. I reacted pretty favorably to the official image of Garfield in the suit, but this photo raises some major issues regarding the suit’s color scheme, particularly the stripe down the leg and the bizarre pattern on the gloves. This suit looks too Spider-Man 2099 for my taste. But what do you think?